Home to Hollywood, fame and fashion, Los Angeles nurtures a culture of cool. But as the sun beats down on L.A., the city’s countless rooftops also emit oven-like heat. A law taking effect Oct. 1 seeks to change that. Base rebate for roof materials that meet the Building Code requirement: 20 cents per square foot. Enhanced rebate for roof materials that significantly exceed Building Code requirement: 30 cents per square foot. Note: To qualify, the Cool Roof Rating Council must test and label your roofing product. Check the website. Under changes to the Los Angeles Green Building code, new homes in the city — including rentals — must have so-called “cool roofs.” Los Angeles is the first major city with this requirement. These roofs use materials that reflect sunlight, helping buildings be more than 50 degrees cooler on the surface. During a hot day, the roofing can lower a building’s interior temp by several degrees. In addition to new construction, roof replacements of at least 50 percent must incorporate cool roofs. If replacing roofs with certain types of asphalt, however, the new code doesn’t apply until Jan. 1. Numerous factors enable cool roofs to reflect more sunlight and absorb less of it. In many cases, the roofs are lighter in color than traditional roofs, but some come in dark colors, too. Cool-roofing materials can be costlier. Luckily, the Los Angeles Department of Water & Power is offering a rebate program. If you’re an apartment owner or builder in Los Angeles, you may be well-aware of the cool-roof rules. Not everyone is, though, and Ron Madsen, sales and purchasing manager at McDonnell Roofing, is trying to change that. In late August, he was spreading the word at CAA Connect — Southern California Rental Housing Conference & Expo. At his booth, Madsen handed out copies of the new ordinance. He also held up a pair of boards: One with rectangular pieces of cool-roofing material, the other with the more-familiar, heat-absorbing variety. 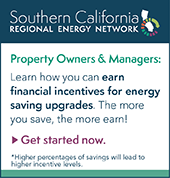 Also at CAA Connect, Craig Tranby of LADWP talked about the agency’s rebates. “Of course you’ll see further offset costs in the long run because you’ll be saving energy in the building; you’ll have a longer roof-life expectancy because there’s less heat stress on the roof and things like that,” said Tranby, an environmental supervisor. He said his agency is informing everyone from manufacturers to distributors to contractors about the new law.